Ritz Seafood in Voorhees, NJ was our choice for the second half of a back-to-back BYOB weekend. It also helped that Ritz was located in the same shopping center as the Ritz Theatre where we were going to see “The Road” at 7:40 P.M.
Again, as last night, my wife, Kathy, and I were joined by our friends Carol & Joe B.
Ritz Seafood is another small dining establishment, well lit and, lest I forget to mention this later, I love what they do with fish! It’s one of those menus that take you forever to make your choice because so many items sound so good. All four of us opted to do the FOUR COURSES for $35.00. This is where the menu takes on the complexity of the Chinese “one from Column A. two from Column B”. Most of the regular menu items are offered on the “Four Course” Package but a few of them require a couple of additional dollars not to mention that you can pass on the Salad and add a soup or pass on appetizer and add something else. You do need a degree in Culinary Foods to complete your order. It’s fun though, and eventually we had all settled on our choices. There were so many different items coming t0 our table that it’s going to be tough to remember them all but I will do my best. I should take notes but I’m usually intrusive enough in restaurants taking pictures of the food. If I took notes I’d have little time left to eat. 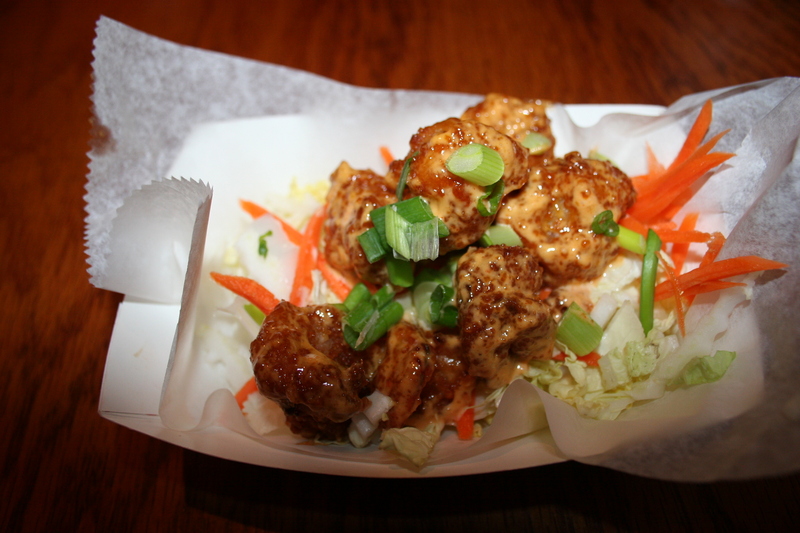 Kathy and Carol started with the Vietnamese Bang Bang Shrimp , tossed in a chili and garlic aioli. The women loved them and the sample I was given showed why. Nicely cooked shrimp in a spicy, tangy sauce. Joe ordered the New Zealand mussels with black bean and garlic sauce. He thought they were good. Not being a mussel fan, I didn’t try them. or even take a picture of them. I found so many different items appealing I was hard pressed to make a decision but finally selected something called Sweet and Spicy Grilled Rice Gnocchi”, chili garlic sauce and sesame. This was a very unusual dish which I totally enjoyed. 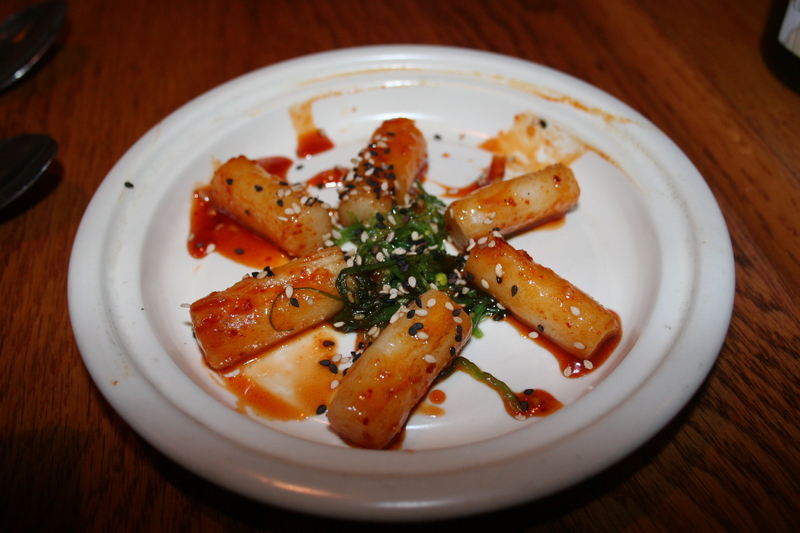 Six perfectly cooked “gnocchi” with the same sauce as the Vietnamese shrimp. They were tasty and had just the right bite of seasoning. I made a good choice! Instead of salad, I paid $2.00 more for the Lobster Bisque. The others all had the Soup du Jour which was Summer Squash. My Lobster Bisque was fine, nothing memorable. I have had much better and many that were worse. 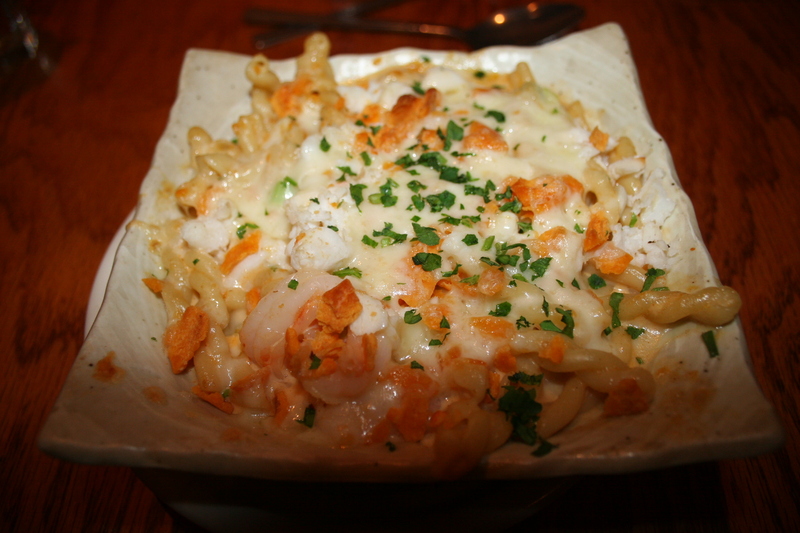 One of the items that was offered as both an appetizer and an entree was their Lobster Mac and Cheese, with shrimp and crabmeat in a lobster sauce. It sounded so good we ordered it as an appetizer in addition to our other courses just so all of us could try it. It was DELICIOUS. It would have possibly been too much as an entree because it was so rich and flavorful that four of us could split an appetizer and feel content. We might have had to bring in the County Coroner had one of us had the Lobster Mac and Cheese for an entree. Selecting an entree was a difficult task. When the waiter, Scott, stood poised with pad and pen before me, I had narrowed my choice to 11 different offerings. I decided on the Chef’s Blend , which consisted of Tilapia, Devilfish and Hawaiian Butterfish, each with an appropriate sauce. It included crisp vegetables and rice. 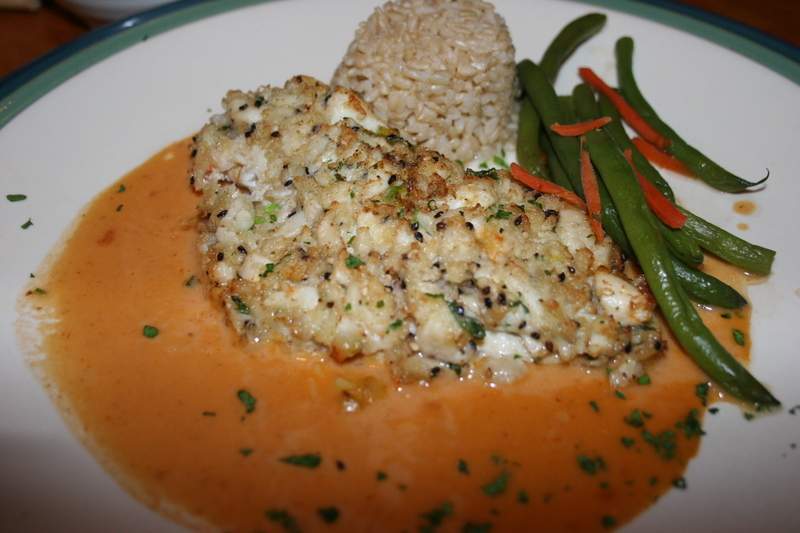 The individual treatments that each fish received was a nice touch and increased the flavor components greatly. 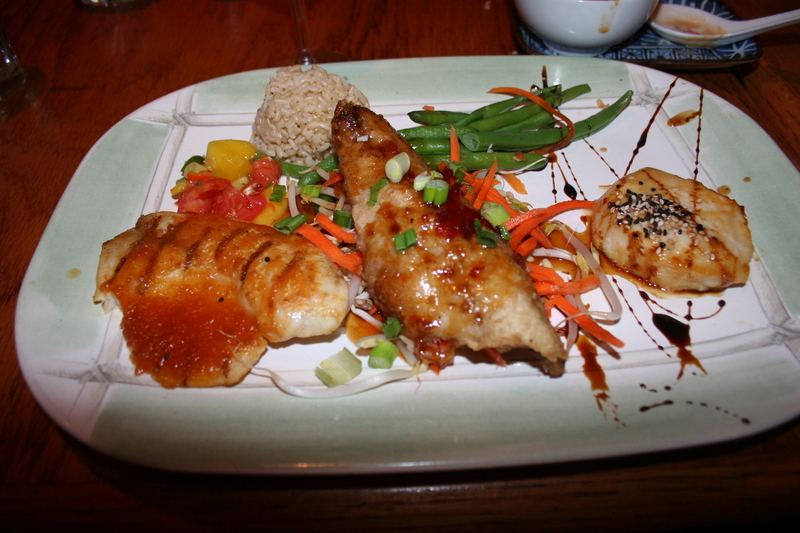 My dish was terrific, especially the Butterfish portion, and I was happy with my final decision. 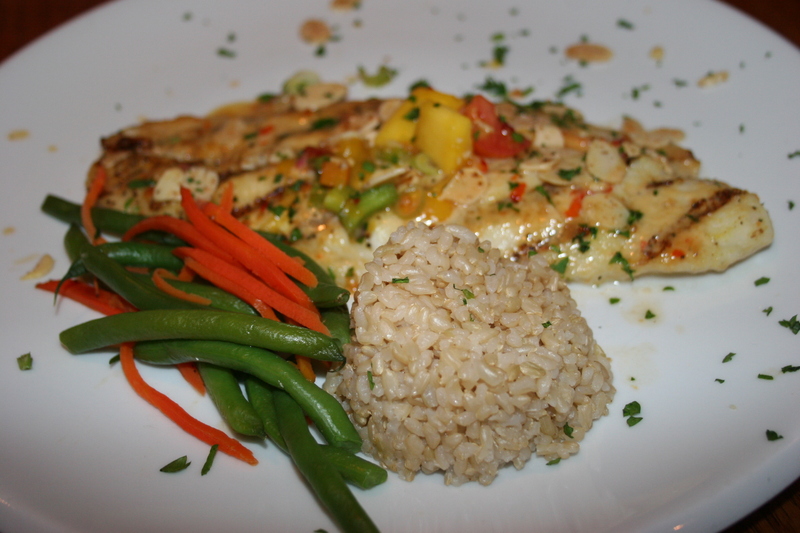 Kathy ordered the Pan Roasted Japanese Black Bass, with a lime and coconut topping and mango salsa, mushroom risotto and spring vegetables. She thought it was very good but would have preferred the topping more evenly covering the fish. I had a sample and liked the coconut flavor with the fish. Joe ordered from the evening special list and his was a striped bass with an Asian spice sauce accompanied by a mushroom risotto and spring vegetables. He did say that he was pleased with his meal, and although I didn’t taste it, it looked wonderful. 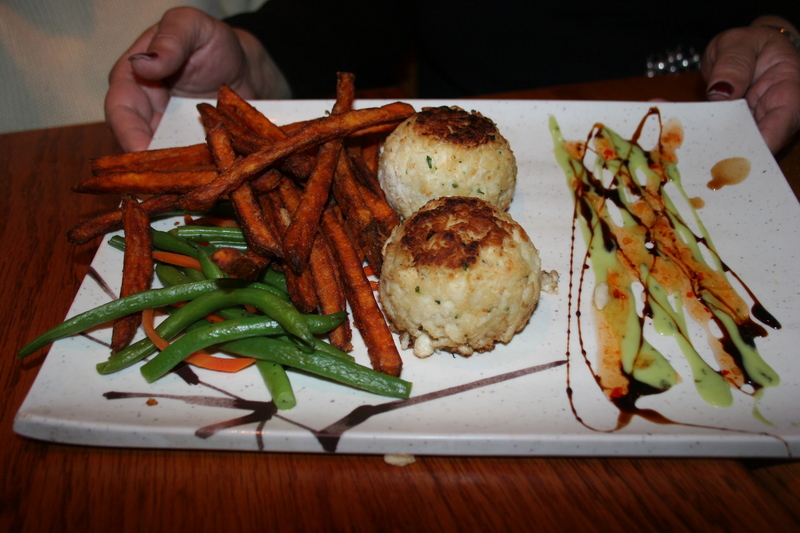 Carol chose the Broiled Lump Crab Cakes with Sweet Potato Fries and Wasabi-Tartare. It has always been my belief that crab cakes is a safe choice. Carol thought her crab cakes were high quality with lots of crab and little fuller but felt they lacked a lot of taste. I didn’t try them so I have to assume that this dish was the only one that didn’t draw rave reviews. My wine for the evening was a good one. 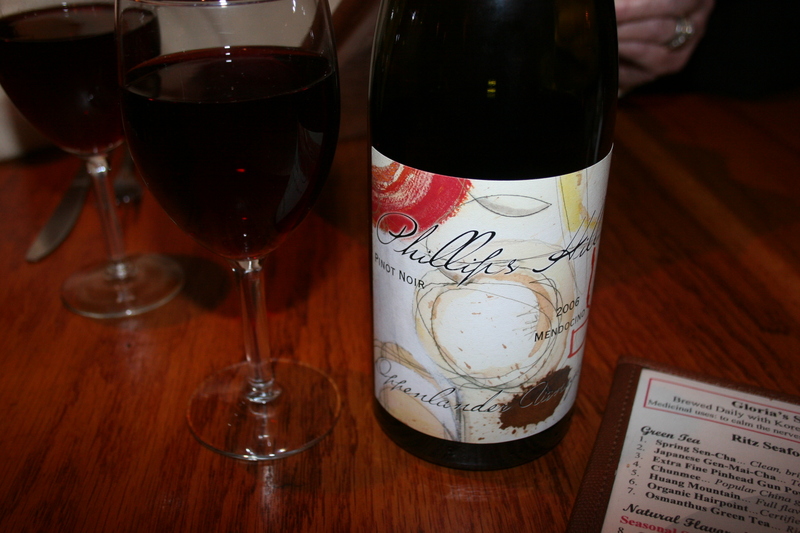 The 2006 Phillips Hill, Oppenlander Vineyard, Pinot Noir is a very small production Pinot Noir from Mendocino County in California. Toby Hill makes only about 500 cases of this soft, subtle wine that evokes flavors of soft strawberries and floral tinted herbs. It’s perfectly balanced and goes well with all types of fish. This is a great example of how good California Pinot Noir can be when crafted by those who know their trade. Our FOUR COURSE meal included dessert so we had to try Chef Dan Hover’s famous Triple Coconut Cream Pie. 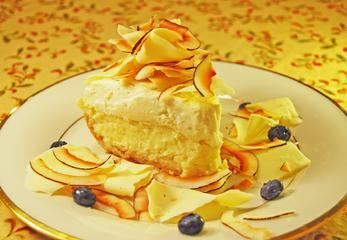 This is an almost perfect dessert because it’s light and delicate texture is the perfect ending to a big meal. Kathy felt it was a little too light but she was infatuated with Joe’s dessert featuring a pumpkin flavored bread pudding with caramel glase and apple spice gelato. I have to admit, that was pretty good, too. Owner Gloria Cho can be justly proud of Ritz Seafood as it has won many local awards and continues to put out interesting seafood with an infusion of Asian spices that make this restaurant more than just a place for fish. 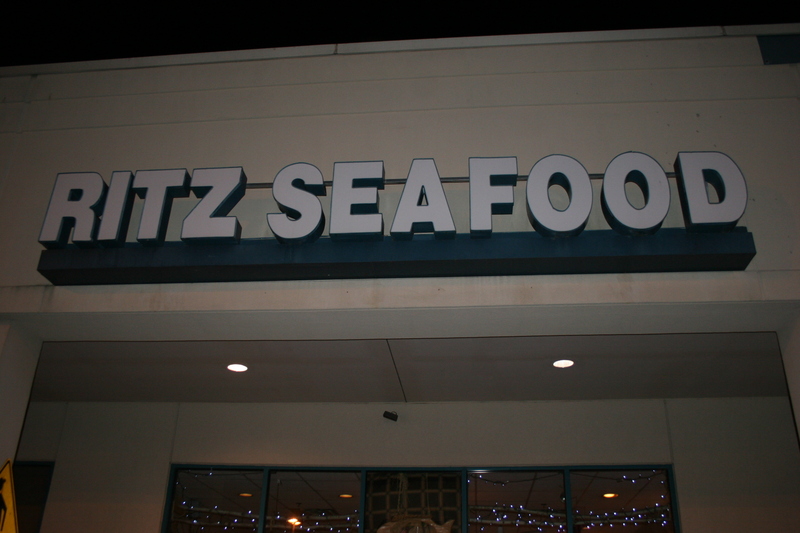 I would certainly hope that a return trip to Ritz Seafood is in the very near future.